Watch Jeremy Paterson, Chair of the Primary Latin Project in England, standing upon the Fourth Plinth in Trafalgar Square, greeting American teachers, promoting Classics, and reading Latin to passersby! What is the Fourth Plinth? Find out more! Who Says Latin Teachers Aren't Cool? Conventiculum Lexingtoniense has a YouTube Channel! If you were in Kentucky last week, you could have been speaking Latin or singing songs with dozens of your friends and colleagues at the Conventiculum Lexingtoniense! Thanks Rogue Classicism for pointing these out! Students from St. Andrew's Episcopal School and Hill Country Christian School of Austin gear up for the highly competitive national Certamen competition to be held this month in Sacramento, California. Apparently, the members of the Monty Python got so fed up with people uploading all their material to YouTube, they have decided to take revenge upon their fans! In response, they've created their very own Official Monty Python YouTube Channel and have placed high quality clips from their movies and television shows there, along (of course) with links for you to purchase full CDs and DVDs. So, here you go, from the Official Monty Python YouTube Channel, every Latin teacher's favorite Monty Python clip, "Romans, Go Home!" You've probably watched it a thousand times on YouTube before, but at least now you can do so with a clear conscience! And as a bonus, "What Have The Romans Done For Us?" There's a wonderful story in the Albany (NY) Times-Union today about Lt. Col. Virginia Sweet, who was a pioneer in women's aviation. She was one of World War II's WASP (Women's Air Service Pilots) corps, considered to be civilian pilots at the time and finally given veteran's status in 1977. Apparently, she graduated with a degree in languages from Duke University and the Sorbonne and was a French, Spanish and Latin teacher for many years. It's a really fascinating article, definitely worth reading! You can read the full feature story, She Left Her Heart in the P-51 at the Albany Times-Union as well as her obituary. The BBC Magazine has a new seven question Latin quiz online today, as part of their University Challenge series! Percy Jackson and the Lightning Thief! Barbara Bell, the acclaimed British author of the popular children's Latin series Minimus, has been named to the 2009 Queen's Birthday Honours List for "those who have gone the extra mile to make a difference to the lives of people around them." Bell received her MBE for her work as "a classics teacher at Clifton High School in Bristol, who has raised the profile of the subject and increased its accessibility." Rose Williams will be leading a webinar in Bolchazy-Carducci's summer series for Latin teachers on July 16th, 6-8PM Eastern: "Making Room for History in a Busy Latin Class". Rose will give a brief overview of Roman history for use very early in the first term which can be used as an outline for the overall study of Latin. Various historical materials that can be woven into your lesson plans will be presented. Webinar attendees may submit questions and suggestions in advance of the session, and will be asked to submit ideas for using these materials in their respective teaching situations after the seminar. Before the webinar beings, each participant should search his/her text or teaching plan for advantageous areas for integrating history materials. If you would like to attend, please RSVP to info@bolchazy.com or register online at http://www.bolchazy.com/webinars.html. There is a $99.00 charge for the two-hour,live session. By participating in this session, you may qualify for professional development credits. Free Yourself by Reading Latin! A wonderful op-ed piece in the New York Times today from a busy political science professor who has decided to take time out to read Vergil's Aeneid...in the original Latin! He doesn't expect to get any profound answers for the world's troubles, so just why has Alexander Motyl bought a grammar and dictionary? To find the answer, read Back to Latin! In Memoriam Edith M.A. Kovach, Ph.D.
Edith M.A. Kovach, PhD, a teacher and professor of the Latin language for many years, passed away on July 1, 2009. Dr. Kovach made a number of important contributions to the teaching of Latin and the Classics in the United States. She will be greatly missed! You may wish to read more about her life and many accomplishments as well as memories from her family, friends, colleagues and students. Latin, It's Not Just for the Romans Anymore! Most people would be surprised to know that more Latin literature was written by Europeans in the millennium after the fall of Rome (circa 476 AD) than during the preceding thousand years of Roman might! (I was!) A compelling case for The Importance of Post-Antique Latin, the Latin of Western Europe after the fall of Rome in 476 AD, is made on the Latin for the New Millennium site. (Click on "Why Learn Antique Latin?" on the splash page.) According to this article, by learning the Latin language, students not only have an insight into the ancient world, but the Middle Ages, Renaissance and Enlightenment as well! 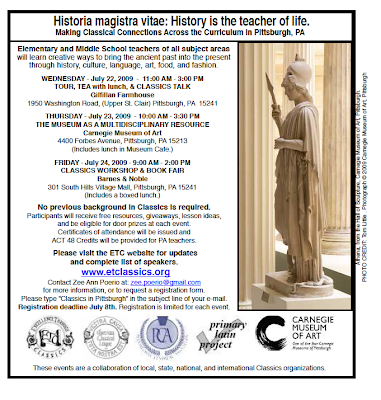 Meet the Author of Minimus Latin in Pittsburgh in July! Elementary and Middle School teachers will learn creative ways to bring the ancient past into the present through history, culture, language, art, food, fashion and technology. No previous background in Classics is required. Certificates of attendance will be issued and ACT 48 Credits provided for Pennsylvania Teachers. WEDNESDAY - July 22, 2009 11:00 AM - 3:00 PM TOUR, TEA WITH LUNCH & CLASSICS TALK Following a tour, and tea with lunch, our Guest speaker Barbara Bell, Director of the Primary Latin Project in the UK and author of Minimus: Starting Out In Latin and Minimus Secundus will speak briefly about tea customs in the UK and will present a Classics talk in the Gilfillan Farmhouse at 1950 Washington Road, (Upper St. Clair) Pittsburgh, PA 15241. Built circa 1857 in the Greek Revival Gothic Architectural style, the Gilfillan Farmhouse is an historic landmark. Book talks by Barbara Bell, Norma Goldman, and James R. Clifford, Jr. Participants will receive free resources, giveaways, lesson ideas, and be eligible for door prizes at each event. Please visit the ETC website for updates and complete list of speakers. Contact Zee Ann Poerio - zee.poerio@gmail.com - for more information or to request a registration form. Registration is $25.00 for each event. Writer and blogger for the London Times Sarah Ebner ponders the usefulness of Latin and Greek studies and asks her readers if they see any point to studying the Classical languages. There have been many comments in reply, mostly positive, including a great response from Cambridge Classics professor Mary Beard as well as a link to a past entry on her own Times blog A Don's Life.